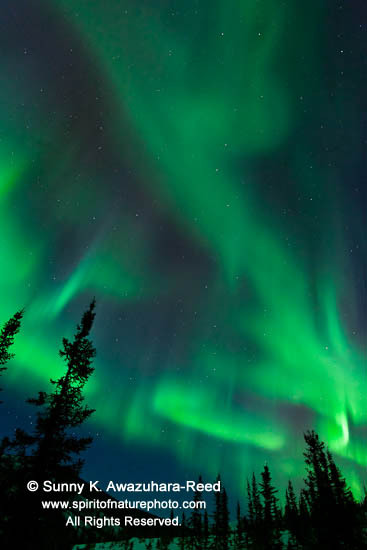 Spectacular Northern Lights occur at the time of magnetic storms, and when the sun's activity releases solar flares. 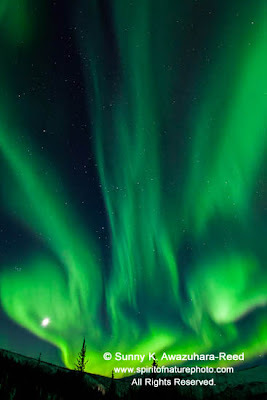 In early March, another amazing Aurora was displayed for two nights! 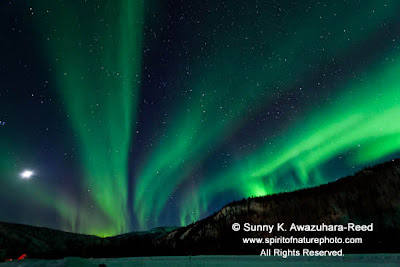 The lights were very bright; clear and vivid even in the southern parts of Alaska! Here in the interior Alaska, right below the Arctic Circle, the brilliant neon green was a waving tapestry of light draped across a nearly full moon. 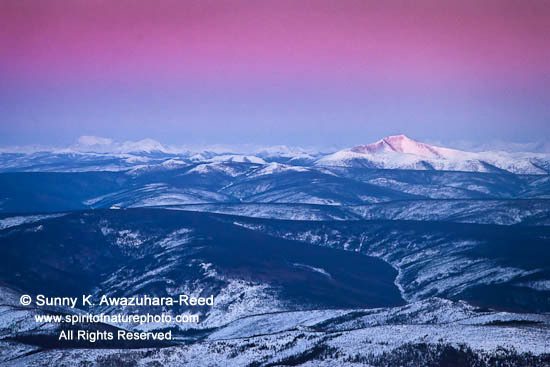 The huge zenithal fires blazed the entire sky with the edges displaying a rarely seen purple color! 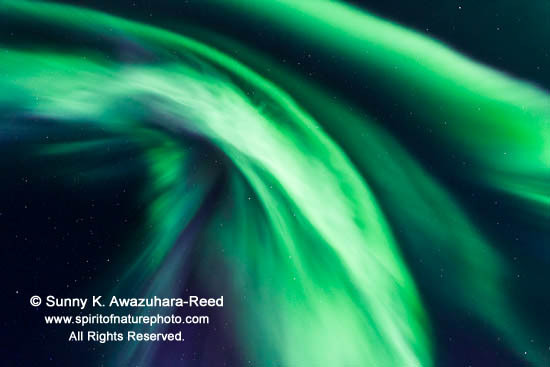 The amazing Northern lights show went on and on... At its zenith, the Aurora corona appeared like fireworks! In older times, Alaskan Natives believed countless myths about the Northern Lights. Many of them feared the active display of the Aurora. 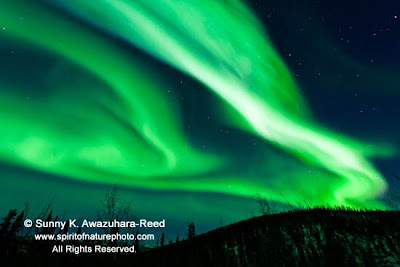 Some believed that the Aurora were the spirits of dead ancestors playing a ball game with a walrus skull. Interesting, isn't it? My short photography excursion will be coming soon. I'll take another Alaska Marine Highway ferry from Whittier to Juneau at the end of April offering many opportunities for dramatic landscapes. I will then explore Sitka, an historic southeast Alaska town, for a week in early May. I'll keep updating new photos and stories in this blog. Please check back soon. 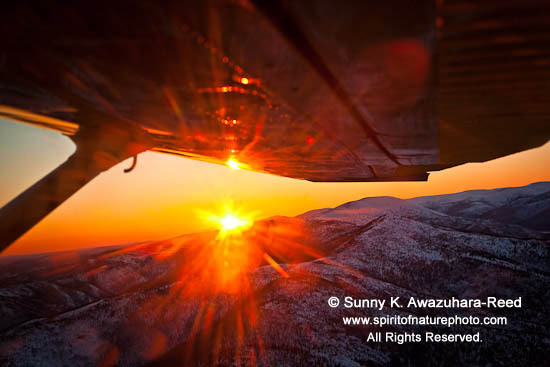 Sunset Flight - Denali View! 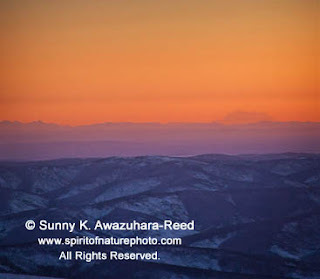 One winter evening, I was on a small airplane flying outside of Fairbanks. 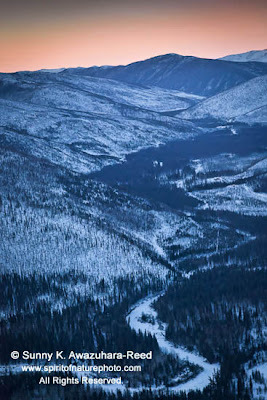 Fairbanks is the second largest city in Alaska, but the city is surrounded with a vast wilderness. The plane was following along the winding Chena River; frozen and snow covered... the whole area is wild backcountry; hard to see any human imprint. Mountain after mountain spread on all sides. The sun was about to set on the horizon, lighting up the rugged Alaska Range... The silhouette of Denali (Mount McKinley - the highest peak in the North America) appeared beyond the mountains in the dreamy orange light! It was a gift for the day!